Yeah, I fell for it, too. 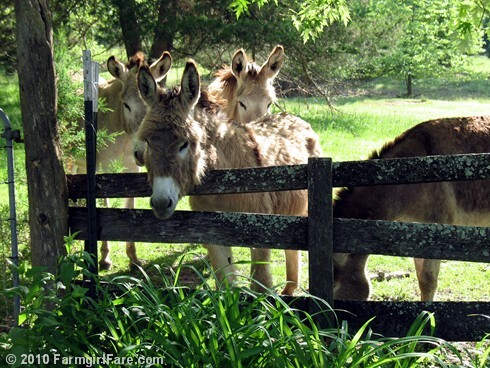 Why do we have donkeys? Their priceless entertainment value! 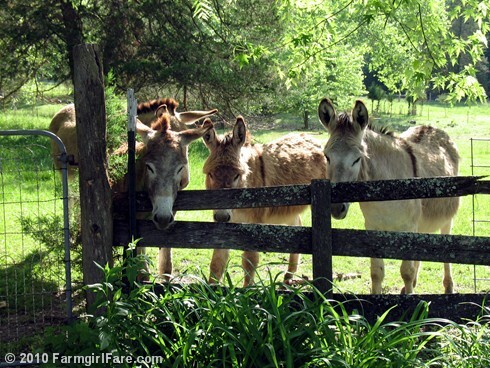 © Copyright 2010 FarmgirlFare.com, the pushover foodie farm blog where I once read that the easiest 'bad' thing you can do to your donkey is overfeed them and let them get fat—and that it's so easy to do because they're extremely good at looking like they need more treats! All those sweet faces need are big pink bows in their foretops. I don't blame you. I TOTALLY would have fallen for it, too. I thought they were eyeballing whatever is growing on the other side (foreground) of the fence - the grass is always greener etc. etc. - they are certainly adorable. It's the eye lashes. It'd get me every time. Once you understand that they are your master you'll stop feeling so guilty! I had to surrender to my cats. Hi there. They do look like they need treats! 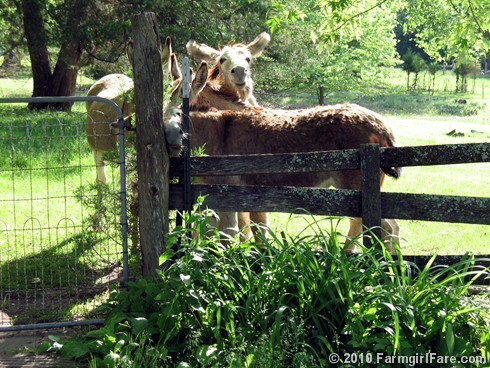 I'm curious-why do you keep donkeys? I'm plotting and planning my future homestead and have been thinking a lot about animals lately. I hear donkeys are great lawn mowers! What would be other benefits, and are they social animals? Sorry! I just saw the answer to my question. 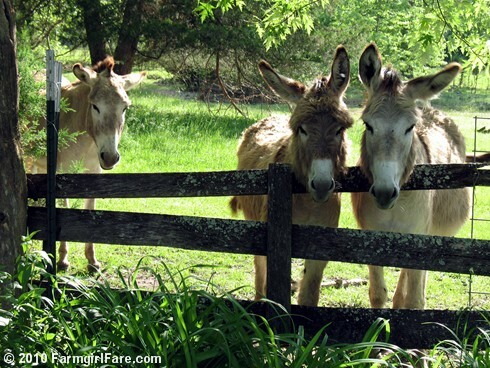 . .
"Why do we have donkeys? Their priceless entertainment value!" 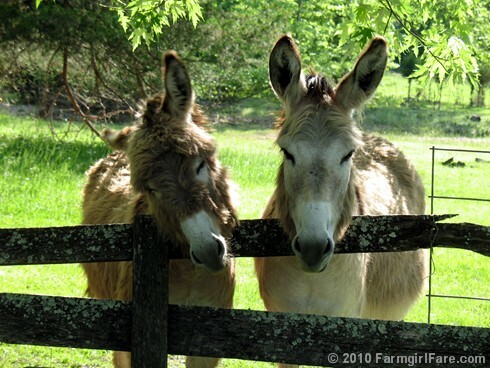 Easily the sweetest donkettes ever! I couldn't resist a face like that either. Well, what do they get for all that begging? Tea and crumpets? An apple pie? Cherry soda with dried raisins, ginger snaps? I'm sure whatever it was, they loved it! I've never been able to get my horses to like brownies...that's a weird one to me. All that sugar, surely, all hooved animals should love brownies? The fourth picture from the end, with the two cute donkey heads, is especially cute. They're irresistible. I just found your blog on Life is a Highways Versatile Blog award post. Your blog is adorable. My family raises sheep; Shropshires to be exact. Love your blog!!! So Cute! I especially like how they are shaggy right not. 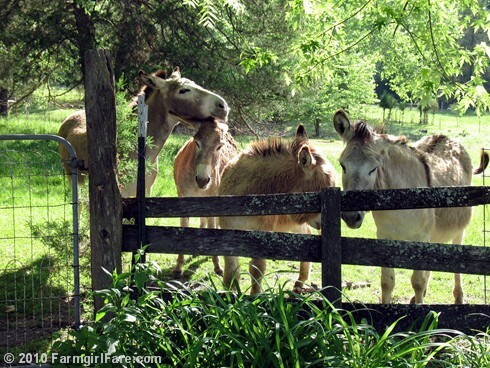 Do donkeys every do anything besides standing around and looking cute? I hear that they are good at guarding sheep. Is that true? I was commenting to my DH the other day about how cute yours are, and we got to wondering about that. 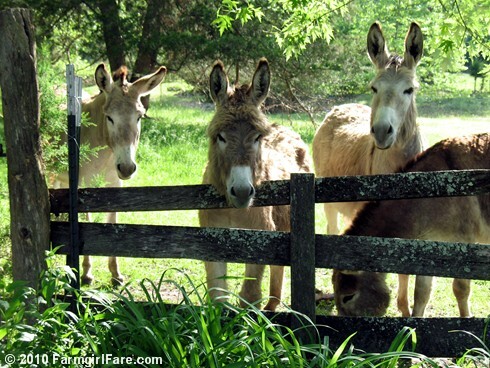 The Donkettes: Forgotten one-hit-wonder girl group of the 1960s. What ever happened to the lovely ladies who brought us "Your Love (Is Like A Hee-Haaawww)?" 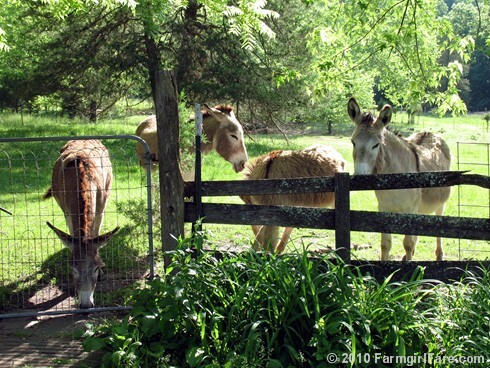 When Decca didn't renew their contract in the fall of 1962, the Donkettes retired to live the quiet farming life in rural southwestern Missouri. I'd love to follow your blog but can't find a "follow" button? I'm relatively new to this blogging world though so maybe it's there and I'm missing it. My great grandmother used to have a Donkey named Lilly. She begged for homemade biscuits everyday, which my great grandmother always made just for Lilly. The rest of us were lucky if there were biscuits leftover!